There is one other sauce in the range, Free From Creamy Mushroom and White Wine Cooking Sauce but I'm currently avoiding mushrooms due to unexplained reactions. All the sauces are Vegan and free from Gluten, Wheat and Dairy. I've pictured above the meals I made using the different sauces, we keep things simple by adding vegetables, tofu or meat substitutes. I can honestly say we have enjoyed them all. My Boyfriend has eaten them with me and he is does not have any dietary restrictions. I must say I rarely struggle to find allergy friendly tomato pasta sauce so I would be more inclined to re-purchase Korma, Tikka Masala and Green Curry. It is rare I will have an Indian takeaway due to many dishes containing yoghurt or cream and Thai can often contain fish sauce. 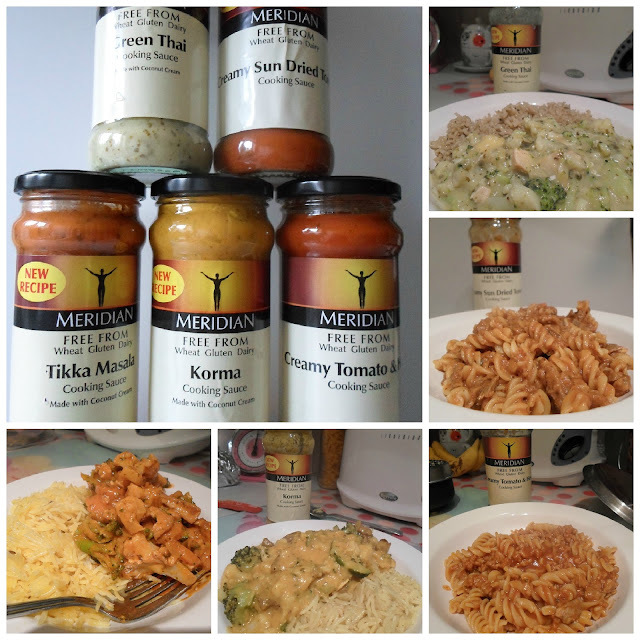 If you would like to give these cooking sauces a try, you should find them stocked at supermarkets and health food stores. It's easy to search for local stockists on the Meridian's website. I've spotted these in many health food shops but honestly the packaging put me off as it made them look cheap. Snob over here! But as I'm trying to cut out dairy I should look at the korma sauces (I love korma). Ooh that sounds delicious, I have reviewed some of the nut butters but not peanut. I admit I'm a lazy cook after work & that's why I like these, they make a nice quick meal.